There's nothing like finding a good garage sale score that can be split it into multiple sales. When done right, it can be the flip that keeps on giving! Last fall, I came up with a nice little find that did just that. A twenty dollar purchase turned into...well, check it out. sometimes be a problem. They're often filled with too much stuff and shoppers, packed in too little of a space. The other problem I've found with "inside the garage" sales, is there's not enough light to see anything! Have you ever noticed that? 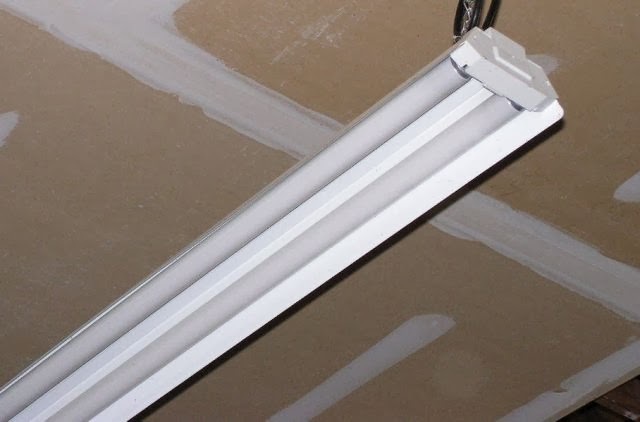 Typically, a garage only has a few light bulb sockets, or a crummy fluorescent shop lamp hanging from the ceiling. Invariably, the shop lamp has just one working bulb, while the other bulb buzzes, but never fully lights up! This makes it so dark inside that you need a miner's helmet to see your way around...it's crazy! Fortunately, this particular sale was not as bad as all that. I could see my way around and spotted an old cardboard box for Aurora HO slot cars. Because it looked old, the box caught my eye. It originally contained a complete Aurora HO racing track set from the Sixties era. There were some neat graphics on the outside, but the actually Aurora racing set was long gone. The box was now used to store some other slot car related items. Inside the old box, I found a smaller box containing a bunch of old plastic buildings. Underneath that was an another wallet-size box. It contained a tiny electric lamp post for a platform layout. The seller was asking twenty five dollars for both boxes. I've had some great scores with slot car related stuff in the past, so I was definitely interested. There's a huge demand for anything slot car related, mostly from baby boomers who played with the Aurora racing sets when they were young. If you find anything related to vintage slot cars, whether it's buildings, track or the cars.....buy them! Following my own advice, I negotiated with the seller, buying both boxes for a twenty dollar bill. The empty box was not part of the deal. Instead, the seller used it as a shopping bag, stuffing the two smaller two boxes back inside so I could carry them down to my truck. Feeling pretty good about my Friday purchase, I tossed the box in the back of my truck and headed home. Slot car related stuff is guaranteed money, so I wanted to post my finds on eBay as soon as possible. I started with the four models. They depicted buildings you'd find around a race track, including a snack bar, gas station, racing stands and a first aid station. The picture of a race scene on the box lid was pretty cool too. After taking a few pictures showing the buildings and box lid, I posted the set on eBay. The auction quickly returned back my twenty buck investment...and then some. It sold for $53 dollars! I was off to a good start! With the buildings sold, it was time to move on to the little street light. My little lamp post auction ran during the holidays, assuring more interest since it could be used on a Christmas train or race slot car platform. Sure enough, the tiny lamp sold for a solid ten dollar bill. Adding that sale to my tally board, I now made $63 bucks on my Friday garage sale score. Not a bad score overall, right? But wait, I still had one more item. Remember that empty cardboard box? The one the seller gave me for free? Yep....sold that too! As mentioned earlier, the box had great graphics and dated back to the 1960's. There are plenty of collectors who want an original box for their Aurora HO track sets. Who am I to deny them an empty box? I posted the box on eBay and it sold for...are you ready for this? Fifty one dollars! That's a lot of money for an empty box! Subtracting my original $20 dollar investment, I made $94 big ones between the three auctions. It goes without saying that I love Friday yard sales! Not to mention slot cars, plastic buildings and most importantly, vintage boxes. Keep an eye out for all that stuff at the yard sales. They're money in the bank...or in this case...the box! I know there is a lot posted but I often wonder if it is against Ebay rules to post an empty box? I know you can not post empty boxes for cell phones, watches and jewelry but I wonder if that applies here as well? It seems that eBay has a problem with certain types of boxes. Apparently there's some concern that fraudsters could use the boxes to sell very high-end counterfeit items like watches,jewelry and computer stuff. You've made some great scores. I am loving that source for strollers you and your husband found-used cars. That's awesome! I love reading your posts Dude, your thoughts and mine run parrallel. Its probably a good thing we don't live near each other. But I do consider us Brothers in Arms. Keep the posts coming they are both informative and entertaining. Thanks Budcat, I really appreciate that! It probably is good we don't live near each other, right? Only room for one sharp garage sale picker in each town! Ha! Keep on keeping on at those yard sales. When you make a sweet score let me know. Always like passing those stories along. Thanks again for the nice words....Dude! Lorraine-I remember those Matchbox "Yesteryear" cars from back in the day. Actually came across a bunch of them all in their little boxes at a community sale at the local church. THis was back in my pre-blog era I cleaned up on those things. Like you, I had at least one empty box and sold it for good money. ($32-I still have the photo) But I unfolded it and shipped it flat, rather then put some filler inside. I am loving your blog piece on those Loopy doll things. Gonna try to remember those when out on the hunt! Wow! I can't believe they bought the empty box. Well, I believe it, but still, that just goes to show that anything will sell. Something similar happened to me when I purchased 4 bags of miniatures from GW one day. Most of them looked like Happy Meal junk, but I could see a few in each bag that I thought would sell well. When I got home and researched, I was thrilled. Turns out that most of what i had would sell well. I paid $16 total for those 4 bags. I've made almost $1,000 off of that investment, and they are still selling. That's what I all a Mega-score...nice! The thing I left out about the sale of the empty box was the shipping costs. I put it inside a nice, strong box, but it was extremely light. It ended up being super cheap to mail it...an added bonus! Thanks for checking in with you super score....Dude! Awesome story! I wanted to thank you for the advice on blow molds in past posts. Today I was lucky enough to find 3 Empire Light Topper Blow Molds in their original packaging for $0.99 each. I've done some research and the figures I have can go for about $20/ea. I wouldn't have known to pick them up without your help so thanks! Love your blog! Trey- Glad I can help! Christmas blow molds in the original packaging? Sounds like you have a major score on your hands! I sold an old Santa blow mold during the holidays for $20, so you may be able to do even better. If you can hold off until next Christmas season, that would maximize your sales too. On the other hand, sometimes its nice just to move the inventory and take your profits now. Congrats and let me know how you do with them. Thanks for the nice words, I appreciate it....Dude! At an auction, I bid on several lots of Fisher Price Little People toys from the 70s. Got them all for a total of less than $20. That was enough of a steal as I likely sold everything for over $250 easily. However, there was a shoebox in one of the larger boxes. The shoebox had all the little people stored in it. Well this was no ordinary shoebox. Turns out, the art on this shoebox was made to look like an 80s boom box and it was a collectible now. It was in FANTASTIC condition (as were all the Little People items; likely stored away untouched for MANY years). That box sold for $43 on eBay. That box alone paid for everything I bought that evening at the auction. Unreal. I love it. I knew you can make money selling vintage boom boxes, but not a card board box version of one! Awesome "needle in the haystack" find...thanks for sharing the story....Dude!